 Recession Buster Wine Sale at The California Wine Club! Save up to 72% this month! Put money in your pocket and great wine on your table with this month’s Recession Buster Wine Sale at The California Wine Club.  Wine Focus - Bordeaux white blends If pure Sauvignon Blanc is a little too bold for your tastes, you may find it more refined in this classic French blend.  Recession Buster Wine Sale at The California Wine Club Save up to 72% this month! Put money in your pocket and great wine on your table with this month’s Recession Buster Wine Sale at The California Wine Club. 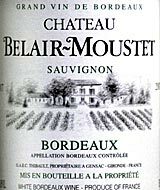  Chateau Belair-Moustet 2007 Bordeaux Sauvignon ($12.99) Simple and fresh, cleansing citric flavors make it a decent food wine at a quaffable 12% alcohol. Some wine lovers just can't get too much of those bold, in-your-face Sauvignon Blanc aromas and flavors. With its aromas ranging from fresh-cut grass to citrus to boxwood or the notorious stench of a territory-marking tomcat, Sauvignon Blanc is no blushing violet of a grape, to badly mix a metaphor (and split an infinitive, too). But those who find this high-volume, high-contrast approach to wine a bit too "technicolor" for their tastes are not standing alone in the world of wine. In Bordeaux, for instance, producers have historically sought to tame the wildness of Sauvignon Blanc by blending it with a variety or two that modify the texture while moderating its impact on the palate. Recipe: Blend Bordeaux-grown white grapes in proportions that suit the wine maker, generally with Sauvignon predominant but a healthy addition of Semillon. Sometimes a splash of Muscadelle, and if nobody's looking too closely, a little Colombard, a little Ugni Blanc. I know this is controversial: Some of my best wine pals shun blends in favor of 100 percent varietal wines, hailing the "purity" of the undiluted grape. But just as I like dishes made from recipes involving multiple yet carefully chosen ingredients, I'm fine with wines made from grapes that complement each other and create a whole that exceeds the sum of its parts. In White Bordeaux (and similar Sauvignon-Semillon blends from around the world), the combination works for me to create a wine with the potential for finer texture, greater complexity and added flavor interest. And it generally goes great with seafood and fish. As with so many other wine styles, there is a lake of inexpensive, simple stuff and a much smaller stream of fine White Bordeaus at exalted prices. But even the cheap stuff, by and large, can offer good value. Just remember to drink it up soon after release, while it's young and fresh. Today's reported wine, Chateau Belair-Moustet 2007 Bordeaux Sauvignon ($12.99), is drinking just right at a year and a half past the vintage. Recession Buster Wine Sale at The California Wine Club! Put money in your pocket and great wine on your table with this month’s Recession Buster Wine Sale at The California Wine Club! Visit www.cawineclub.com or call 1-800-777-4443 to order. Choose from award-winning Super Savers as low as $6.99 per bottle. Get that Diamond Mountain Cab you've been coveting for 40% off normal retail prices, or why not try something new? Choose from hundreds of award-winning, limited-production wines. Half, full and mixed cases are okay. Sale ends March 31, but order early for the best selection! Visit www.cawineclub.com or call 1-800-777-4443, our Personal Wine Consultants will be happy to help you choose your selections. FOOD MATCH: A versatile, food-friendly wine for seafood, poultry, pork or vegetarian fare. It was fine with a light Lenten dinner of fresh local baguettes, some toasted with sharp cheddar and others spread with Capriole Indiana black-pepper goat cheese. It was a decent match with the Cheddar, outstanding with the goat cheese. VALUE: Not over-priced in today's market at a buck or two over $10. WHEN TO DRINK: While a few high-end Bordeaux white blends may reward aging, my general advice - especially for the more modest wines - is to enjoy youthful freshness and drink up soon after release. This 2007 is ready to go. Since distribution is apparently limited to Ohio and surrounding states, however, it may be best simply to consider today's tasting note as representative of the type, modest, generic white Bordeaux, and ask your local wine shop to recommend something similar from an available producer.